My slow cooker (a Rival® Crock Pot, to be exact) got plenty of use back in the days when we had softball games that went into the dinner hour. Since then, I haven’t used it much. Even on work days, there are so many great recipes that can be prepared quickly. So what is the main reason I still have my slow cooker? 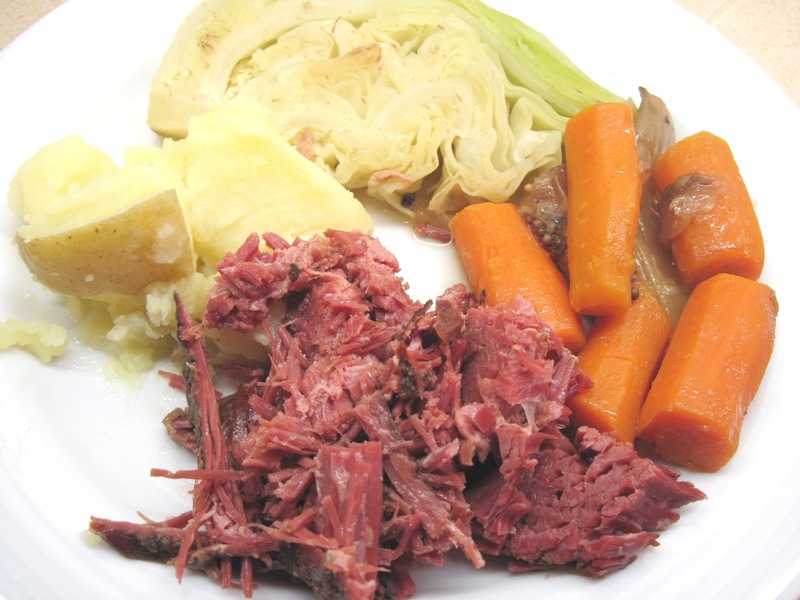 Corned beef for St. Patrick’s Day! 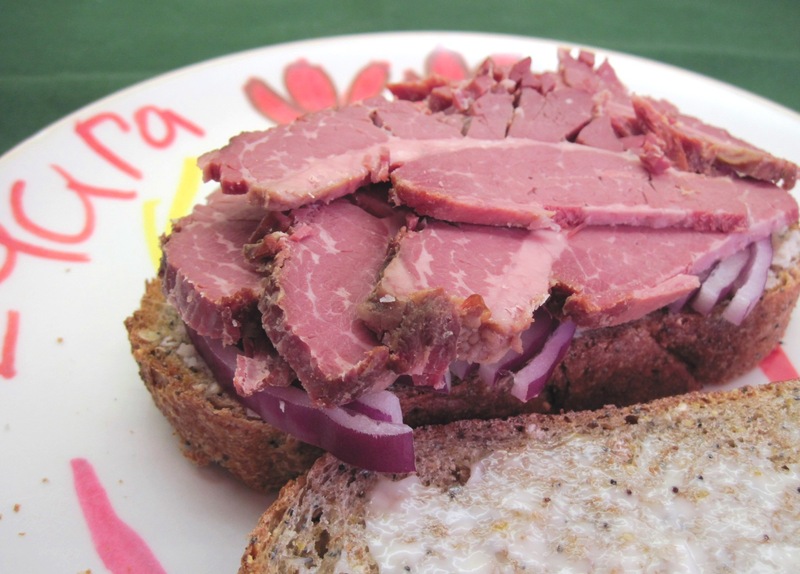 I always get a corned beef from Market House Corned Beef in Seattle; it’s the best! I heard the owner, Vic Embry, talk about cooking it on Tom Douglas’ radio program. He said that you should not rinse it off, and you must leave all of the pickling spices on it. Some people even ask for extra pickling spices. 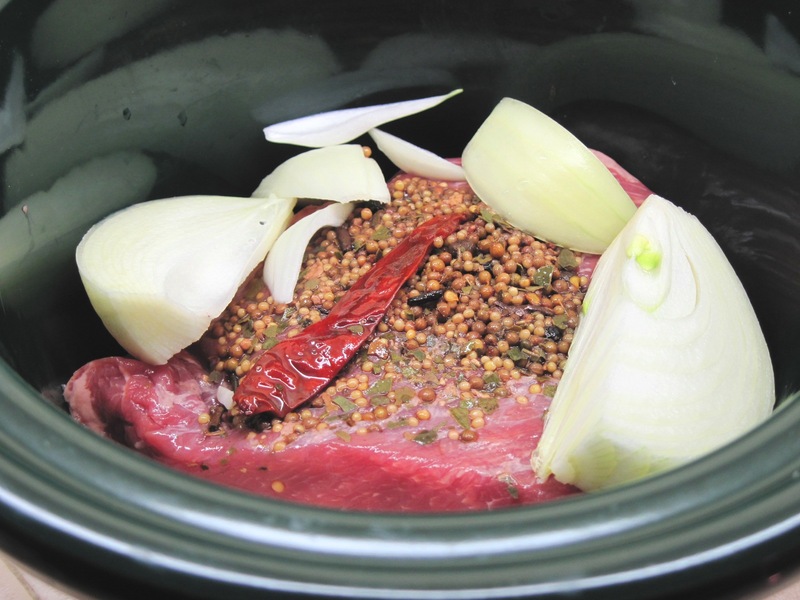 My recipe is adapted from the one that came with my slow cooker. Update, March 17, 2016: If you have a large slow cooker (about 6 quarts), consider trying my new favorite version of corned beef. Click here to see the recipe. It’s only slightly different, but I think it’s improved. Put the carrots in the slow cooker; put the corned beef on top of them, fat side up. Add the pickling spices. Put the onion wedges on top of the corned beef and add the cup of water. The pickling spices and pepper that came with the corned beef are on top. When the corned beef is just about done, heat the oven to Warm. Remove the corned beef to a plate, cover with foil and put in the oven to stay warm. Put the carrots and onions in a bowl, cover with foil and put in the oven to keep warm. Put the broth from the slow cooker in a large skillet over medium heat. Add the cabbage wedges; cover and cook until done, about 10 – 15 minutes. There wouldn’t happen to be any leftovers? What did you put on top the meat in the pic under the recipe? Not the onions… the red thing and mustard like thing?